I'm very excited to announce that I'm helping to organize a conference in Göteborg in March! This is going to be so cool. We've booked the biggest venue in town (Svenska Mässan) and are inviting high profile speakers from around the world. There will be a whole track on development processes and methodology, and I expect to see many leading agile proponents presenting there. If you're interested in presenting, there is a call for papers open right now. 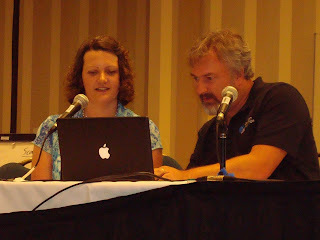 Otherwise, do sign up for the rss feed to hear all the conference news. I really enjoy conferences, agile2008 was such fun, so I'm really looking forward to welcoming lots of interesting people to Göteborg in March! 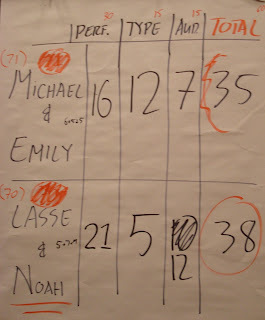 The "Programming with the Stars" final was almost the last event of the whole agile2008 conference, and Michael Feathers and I were up against Lasse Koskela pairing with Noah Jacobson. Our brief from Joshua and Jeff was "you have 8 minutes on stage. Impress us". This seemed a little vague to me, but when pressed, all they said was "you have 8 minutes. Impress us with your skills at Pairing, TDD, Refactoring and IDE expertise." So there. Yesterday (Thursday) was very intense, and I am exhausted. 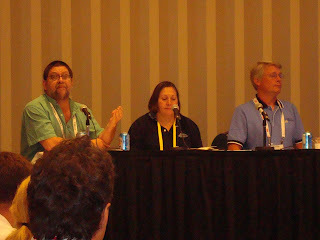 Geoff and I presented a 90 minute slot on TextTest first thing in the morning. We get better every time we do it, and this was definitely the best yet. I ended the session with an extended demonstration of KataBankOCR which I had been practicing loads, and went off without a hitch. Then at lunchtime we did "Programming with the stars" demonstrating JUseCase and TextTest (see my previous post) and directly after lunch Geoff did a 45 minute presentation of xUseCase. The room was packed and lots of people seemed interested. Afterwards Geoff and I spent some time chatting to important people from various agile tools companies. ok ok enough with the excuses. It was a disaster. Eight minutes on stage isn't long enough to achieve much, especially when you are dog tired, unprepared, and nervous. They had warned us it would happen, but when after 4 minutes Jeff stopped us and asked the judges to give us some interim advice, I totally lost my train of thought. All I remember of the advice was Bob Martin telling us to act "perky", so the fatigue must have been showing. When we restarted for the remaining four minutes, the audience began calling out more or less helpful directives. By the end we had written about five lines of code and still had no tests running. The judges were surprisingly understanding and did give us a few points for our pairing skills (they can't have been for our coding, let's face it). Then Lasse and Noah came on stage and did a really slick, thoroughly prepared demonstration including testing with stubs, and a funny video clip. It was well done, and they deserved good marks. Today in "Programming with the Stars" our task was to do "Story Test Driven Development" (aka Acceptance Test Driven Development). With just 6 minutes on stage, this was a pretty tall order. Jeff and Joshua had suggested that we use tools like FIT or Fitnesse to create the story tests, but I thought it might be an idea to try using TextTest. I have an ancient Java application that I have used before to demonstrate how TextTest works together with JUseCase, and I thought I might be able to do something with that. Michael was really cool about all this, which was great, because I thought it was quite a risk to move away from the well-known acceptance testing tools. The most important part about JUseCase is the way it helps you to interact with the customer (domain expert). So we thought it might be cool to bring in someone to act as the customer in the middle of our 6 minute slot. Geoff was the obvious choice since he wrote the tools, and knows how to write tests in them already. So in the middle of our performance, Geoff came up onto the stage for a couple of minutes. He helped us write a failing story test in JUseCase/TextTest, and then Micheal and I made the use case part of it work by adding a new widget. We didn't get the whole test passing, but it was a start. The judges apparently loved this, we got the highest marks of the whole competition so far. Wahey! Now for the final tomorrow! So, Michael produced some horrible looking C++ and led me through setting up a test so we could do "extract method" on a small portion of a hairy looking monster method. He introduced me to a technique called "sensing variable". Basically you write a test that calls the long hairy method, and in the middle of the method just after the part you want to extract, you introduce a "sensing variable" - you assign the result of what will be your extracted method to this global. Then from your test you can check what the global contains, and write an assertion for it. The next step is to do the extract method, and the test then checks that the "sensed" variable is still the same. This should ensure that you didn't make a mistake with the extract method, it is called, and returns the same as before. It's fairly simple really, but it's the kind of thing you wouldn't think of if it wasn't shown to you. In a language like C++, you need all the help you can get. Well, the judges had already awarded some very high marks to the other contestants, and our score was joint bottom, I think. Anyway, it went to audience vote between us and J.B. and Todd. They had done a teacher/pupil act similar to ours, on Eclipse wizardry rather than C++, and had raised considerably more laughs than we had. So I was a little surprised when we clearly got a louder cheer from the punters, and Jeff (the other host) announced we were through to the next round tomorrow! 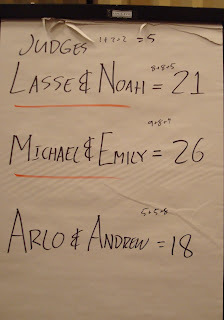 Michael Feathers and I competed in the "Programming with the Stars" competition today, which was fun, if rather nerve racking. Our category was "TDD from scratch" and we chose to perform the FizzBuzz Kata in python. We chose that because we thought it was simple enough we could do the whole thing in the time limit, just four minutes (!). As you can see we didn't bother with a testing framework of any kind, just a few assert statements, and the code that does the work is all one line, (although we put in some line breaks to make it readable). I was pretty pleased we managed to do it without mishap. The judges turned out to be Bob Martin, Rachel Davies and Mike Hill, and they weren't actually as nasty to us as I feared. 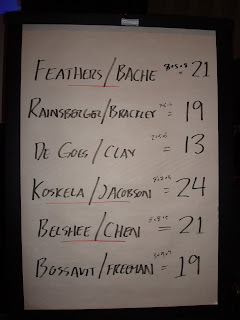 We got good marks from Rachel and Mike, (8/10 from both), and since Bob was mean to nearly everyone, his 5/10 was actually ok. Only one other pair scored more than us, which puts us through to the next round tomorrow. Our category is going to be "Refactoring", which is basically Michael's specialist subject, so hopefully we'll be able to come up with something good. I've just got to Toronto in advance of the agile2008 conference which starts on Monday, and I'm looking forward to it with great excitement and some trepidation. Until now it was the session that Geoff and I are running on Thursday that was claiming all my attention but now my head is also buzzing with another potential conference highlight. I've signed up as a contestant for the "Programming with the Stars" competition, and I got a mail today explaining that I will be performing live on stage with Micheal Feathers on Tuesday! We will have exactly four minutes to impress the audience and the panel of judges with our impressive collaboration skills and amazing feats of coding. I've seen "Idol", I know what "panel of judges" means... we're going to be eaten alive! I just hope I can remember how to code after nearly a year at home with baby. Thankfully I am very confident that Michael Feathers not only knows how to code, but if I do manage to produce anything really dodgy, who better to sort me out than the author of "Working effectively with legacy code"? We are competing with five other pairs, it's a knockout competition, and the winners will be declared on Friday. Wish me luck!